Two rare and long forgotten secrets are revealed again. You do not have to be a medium to produce spirit raps. 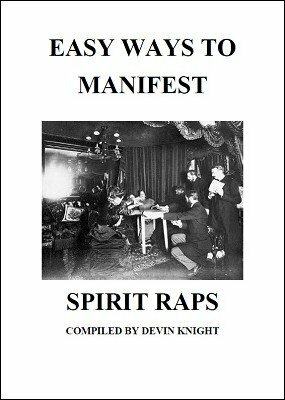 Devin Knight has compiled two of the easiest ways to produce spirit raps ever devised. If you do any type of question and answer act, then the spirits can rap out the answers. This is unnerving to those watching. Imagine walking into any place there is a table. You sit at the table and have two people on both sides hold your hands or wrists so you can't use them. They can also put their shoes on your shoes so you can't use your feet. Under these conditions you manifest spooky raps that answer questions. The psychic, Jason Michaels, used both of these secrets to have spirits rap out the value of a selected cards during his career. Includes Albino's Gimmick-Less spirit rapping method. Imagine walking into any room and even being searched for gimmicks. People can hold your wrists and watch your every move, yet you are able to manifest loud knocks apparently from the spirits. This method was sold to fake mediums in 1935 for $25.00, in today's dollars that would be over $450.00. It was priced high because the method would fool the most intelligent people. In this release, Devin Knight reveals all the details behind this forgotten secret. This information is great for magicians looking for an unusual way to reveal selected cards. This is something that is great for Halloween shows, spook shows or for those who want to scare the yell out of people in their homes. If you conduct séances, then this is a must have. This is extremely hard to find information that was used by those posing as real mediums in the past. The methods are not outdated and work just as well today. This is something modern day audiences have not seen, except in some horror movies. Now you can produce apparent spirit raps in their homes.